I had originally written a Shorter article for my website. This article is on a refined version of the design that I built while writing the article for woodcraft magazine. This table design is intended to allow for working in unusual seating positions. I originally came up with this concept when I wanted to work from remotely from my girlfriend's place in another city. I wanted a table that I could be set up to be ergonomic with any seating opportunity I could find. 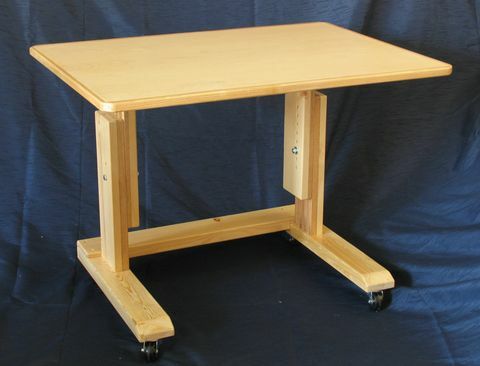 I also wanted to be able to wheel the table out of the way and into a spare room while not in use. 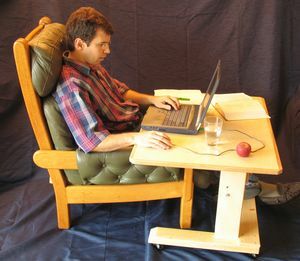 After having built it for that purpose, I found it to be very comfortable to use with a computer in combination with a couch or easy chair at my own house. So I built another one, which I have been using as my main computer table ever since. The idea is to sit down on a couch or easy chair, pile pillows behind myself until comfortable, and pull the computer up to me. This desk is mostly constructed of inexpensive spruce construction lumber from the Home Depot. Getting clean construction lumber is a bit of a challenge. I find it's best to buy 10" wide planks, because those come from larger trees and usually of better quality. One 2x10x10' should provide enough lumber for this project if it is completely free of defects. But given the low cost of construction lumber, it's best to just buy extra lumber and then cut around the inevitable defects in the wood. You will also need a 1"x6"x8" piece of oak for the vertical adjusting slides, another 1x3x6 piece for the trim around the top, and a piece of veneered plywood, 2'x3', and about 1/2" thick. Also, some 3/8" bolts, four 2" castors, and a lot of 1.5" #8 wood screws. Cut the 1x6x6' oak board into four equal length parts, just shy of 16" each. 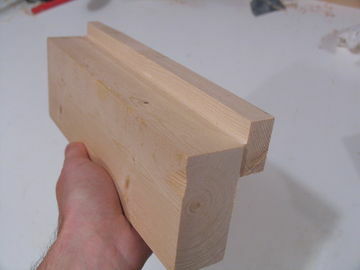 Also cut some pieces of spruce, just over 16" long by just over 5.5" wide by 1" thick. Laminate the oak boards onto the spruce boards, to produce a sort of "sandwich" about 1.75" thick. 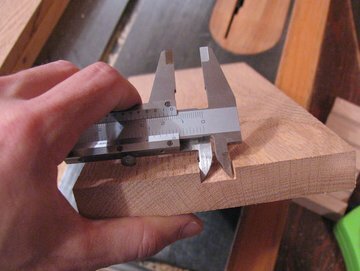 It's easier to glue the oak to a larger size piece of spruce, so that alignment errors can be corrected by trimming back the spruce part. 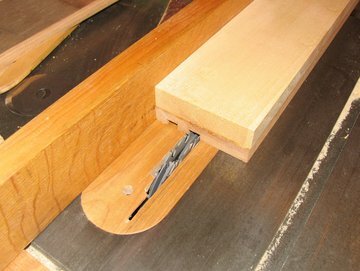 After the glue has dried, use a jointer to cut the spruce flush with the oak on one side (Fig 1), then cut it to 5.5" width on a table saw. 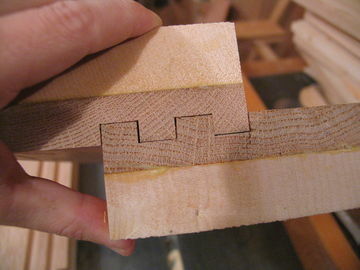 Do a quick check that the pieces will in fact fit into each other (Fig 5) before going further. Do this as soon as possible after cutting the first two pieces to catch mistakes as early as possible. 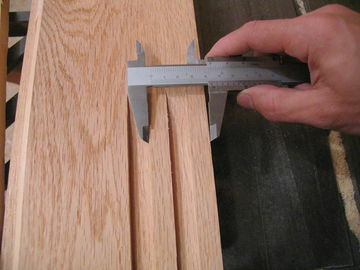 When measuring for cutting the grooves, consistent spacing is very important. If you measure to the blade, mark the tooth that you measure to with a permanent marker. If one of the slots is out by 1/64 of an inch, the grooves may not fit into each other. 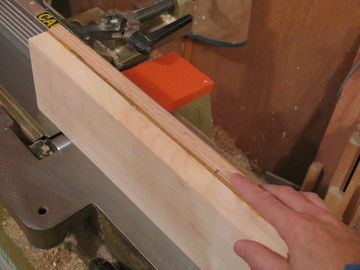 Proceed by making the next two cuts by again moving the fence away from the blade by 1 3/8" of an inch. 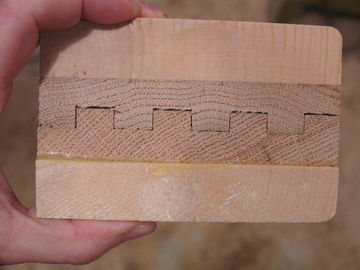 The last grove you cut should just cut the rest of the piece away. The final pieces should fit together as seen in Fig 6. 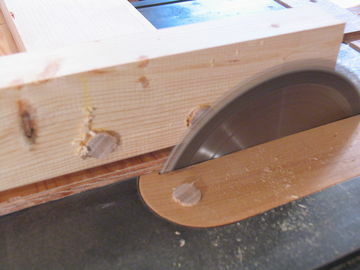 Next use a 1/4" radius router bit to round the outside edges (the spruce parts) along the length of the piece. Next cut a piece of scrap wood, about 8" long by 3" wide by 1.5" thick. Ensure that the edges on this piece are square and true. Also cut another smaller piece of scrap wood, the same length and about 1"x2" and attach to the larger piece as shown in Figure 9. Cut another piece of wood, about 1"x1" by exactly 4" long. 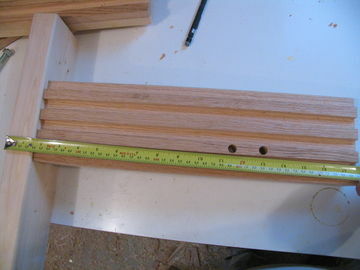 This piece will be used to ensure that the upright is attached 4" from the end of the table support, as shown in Figure 10 - it's the piece with the two nail holes. Use the large guide piece to align the upright on the table support. 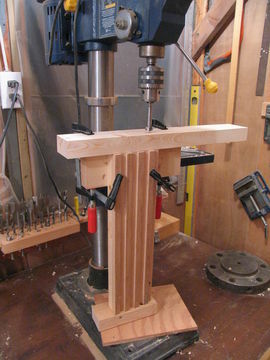 Next clamp the table support and the grooved upright both to the scrap piece, as shown in Figure 11. The centers of the holes should be aligned to go into the middle of the solid (ungrooved) portion of the upright, and with centers about 5/8" from the edges. Drilling the holes straight through both pieces avoids any subsequent alignment problem when joining the parts with dowels. Next remove the horizontal table support piece, but leave the block clamped to the upright. Unless you have a very long 5/8" drill, your holes will not be deep enough, so drill them to a full depth of 2.5 inches after removing the table support part. 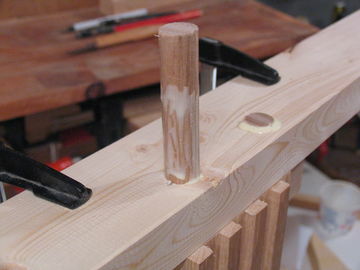 This would be a good time to round the corners of the piece you just removed, as getting at all the inside corners with a router once its assembled will not be possible. Do not round the edges of the surface that will touch the table. Next clean any shavings from the holes, and apply glue to the end of the upright and the mating surface of the table support. 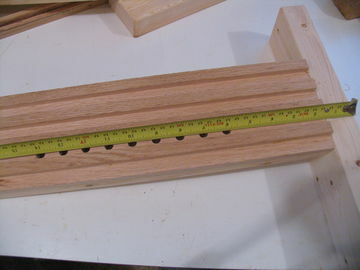 Then put the piece back in place, using the block clamped to the upright as a guide, as well as the 4" long piece of scrap to align it the same way it was before, so that the holes line up. 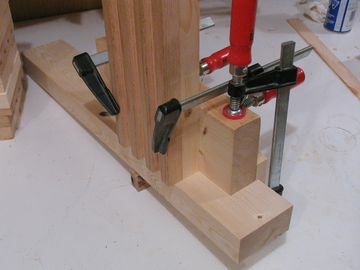 Remove the block and clamps that you used to hold the pieces together while drilling and gluing. 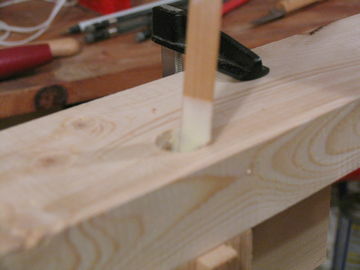 Use a longer clamp to firmly press the T-joint firmly together. (Fig 16). 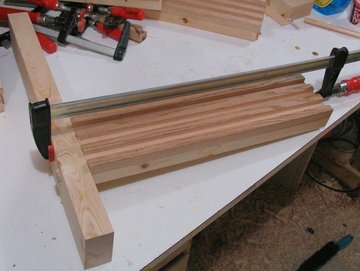 Leave it clamped while the glue dries. Use the same approach for the other upright and table support, making sure they are mirror images of each other. Next assemble the leg pieces. These are just like the table supports, with the difference that the legs are a bit wider. We can use the same guide block for the legs as well. 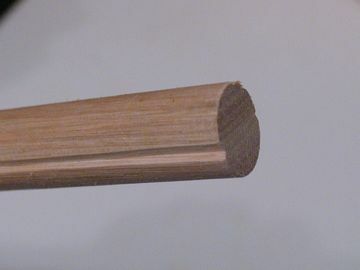 Be very careful that you put the uprights on the legs with the grooved pattern facing the opposite way, so that they will mate with the grooved pieces of the uprights. That is, other than the horizontal part being a little larger, the grooves / slots of the uprights should be a mirror image of those joining the table supports, so that they will mate correctly when you put the table together. Drill these holes nearer to what will be the front of the table. 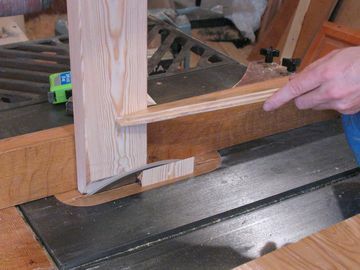 Because the center of mass of the load on the table is likely to be forward of the leg uprights, this will relieve a bit of bending load on the grooved joints. 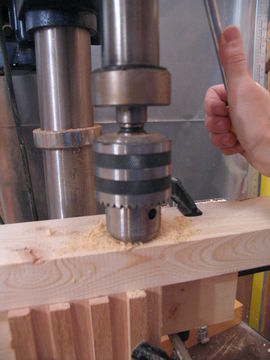 In the uprights attached to the legs, drill two holes, 1.5" apart, one 11.5" from the bottom of the leg and the other 13" from the bottom of the leg (Fig 19). Make these a little larger - 7/16th in diameter, to allow for a bit more room. 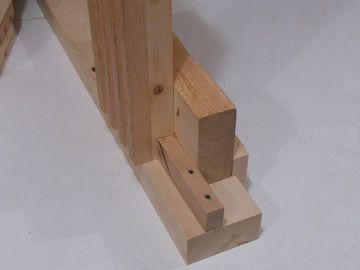 By making the holes in the parts attached to the legs 1.5" apart, it is subsequently possible to adjust the height by 1/2" increments by changing which of the two holes in the upright the bolt is passed through.